Living in the moment. Not, living for the moment. Living in the moment. 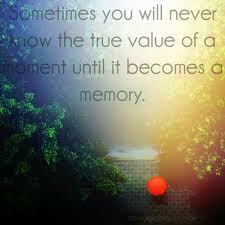 Living life using the value of each moment in the moment in which you are experiencing it. Sounds tricky, right? Well, honestly it is. I am not going to kid anyone here. Mindfulness is one of the most difficult skills to master. This is the case because mindfulness is intrinsically connected to effective living. They embody one another. When all else fails, you have your mindfulness. I know that sounds crazy, but seriously consider this: Let's say you have fallen flat on your face, you attempted a distress tolerance skill and it failed miserably and you engaged in target behavior. The consequences of your target behavior is staring you dead in the eye, you have two choices...A) ignore it and continue to spiral down or B) become mindful of your experience and use it. Of course, ideally mindfulness, if used on a regular basis, will help prevent us from engaging in our target behavior. We have many steps along the way to use our mindfulness exercises. I like to think of my skills in categories of Green, Yellow and Red. Green-light skills are used as preventive measures. Mindfulness is done in this category. Then there is your Yellow-light skills, which are used when your internal alarms begin to be activated for whatever reasons, mindfulness is done at this stage too, sort of as a distress tolerance skill. Then we have our Red-light skills, which are used in crisis - in a way our skill is telling our bodies and minds to STOP! Mindfulness is used here too. This is where I say, "When all else fails, you have mindfulness" because you can use mindfulness during crisis. It is very difficult to teach yourself, and at that point you would just be using it as damage control, but it can be done there. Then, finally, mindfulness is used to get our butts up and pushes us to Fail Well. What is Mindfulness? Check-out the link, but simply put...it is living in then moment. So, the next question is, HOW? This is not something that comes naturally. It may seem simple, but it really isn't. Once you have practiced and practiced, it does become easier. Eventually some of your mindfulness skills will become second nature. I assure you, there will come a time when you are going about your day and you will have very clear moments of saying to yourself, "Wow! I just did that 'mindfully' and I didn't even have to tell myself to do it!" Practice makes ... no, I wasn't going to say perfect! We won't even pretend we can reach perfection because we cannot. In fact, some of us struggle hideously with perfectionism. It may very well be a target behavior we are endeavoring to eradicate. In one of my groups I heard it said this way, "Practice makes Permanent" which is by far more effective. Doesn't that bring some relief? I know when I started to meditate on that statement, I had a sense of relief. I was given the permission to not be "perfect", and I had strong encouragement that these skills would in fact take root. OK, so what you need next is some mindfulness practices to practice with! My suggestion is to set aside a specific time each day to practice. The idea is to get these practices down with very little effort before you actually need it. Grasping at skills while you are falling towards a crisis will only feel more frustrating. Don't expect too much out of yourself, be kind to yourself and give yourself room to grow and get comfortable with this skills set. These practices are foreign to us, in our society we are taught to multi-task, quickly moving from one responsibility to another. We need to be effective time users and when we become emotionally hijacked we misinform ourselves that we do not have the "time" to get to the bottom of it, or that we need to sweep it under the rug and keep moving. Where a hint of that attitude may be needed in certain moments, it is flawed for us to believe that that is the way we handle it, all the time. The key of course, is to know in which moments you need to "shelve it" and which moments you need to sit with it. Becoming adept with mindfulness will tell you exactly that! Visit the forum for specific exercises, we actively post new ones to try and discuss. We want to hear what works for people and what doesn't. We share ideas and experiences, it's what peer-support is all about! Let's look forward to getting to know what our moments are worth! Part of observing is searching within those experiences for useful information to create that life that's worth living!